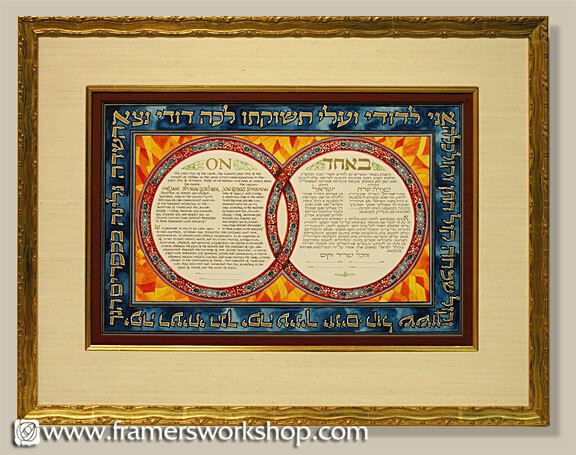 This hand painted Ketubah, owned by Afikomen Celebrations, is framed using a Larson-Juhl water guilded gold leaf frame. It is matted with a raw silk hand wrapped mat, a gold leaf fillet, a deep maroon silk hand wrapped inner mat, and a final inside mat of deep blue Alpharag board. It is glazed with Tru-Vue Museum Glass. The piece hangs in Afikomen Celebrations in Berkeley.